If Santa Teresa has taught us one thing, it is that nothing goes better together than Rugby and Rum. Situated in Venezuela, the historical Hacienda Santa Teresa has a rugby pitch on the grounds, allowing for the perfect way for workers to blow off some steam in their lunch hour. The distillery also supports The Alcatraz Project that sets out to rehabilitate ex-gang members by teaching them teamwork. The ethos of teamwork is one that runs throughout the company, who see their role in distilling as part of a wider team as well. 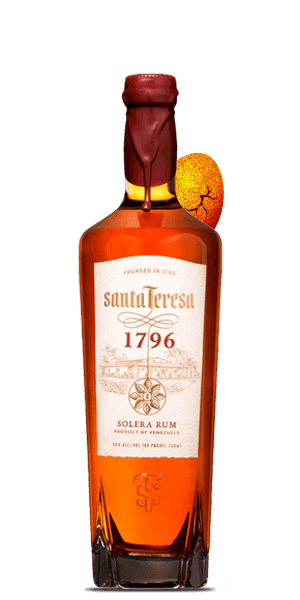 The Santa Teresa 1796 is a vatted Rum, made using the solera system. The ages of the Rums include Rum blends up to 35 years. After maturation the Rum was finished in Bourbon casks, giving it that added wooded sweetness. The Rum combines dull smoky notes with highlights of sweetness and tangy bitterness from dark chocolate. This is amazing Rum that will suit all tastes, as well as any Rum aficionados out there. What does Santa Teresa 1796 Solera Rum taste like? The Flavor Spiral™ shows the most common flavors that you'll taste in Santa Teresa 1796 Solera Rum and gives you a chance to have a taste of it before actually tasting it. Sugary molasses and thick caramel with subtle hints of dark chocolate and roasted coffee beans. Tobacco and smoke first appear and mellow out into a golden syrup sweetness. Lingers on the smoke and ends with a kick of oak wood. Smoky, dark chocolate, syrup, sherry, roasted coffee, tangy, roasted, tobacco, caramel. A bit too sweet for sipping. Very smooth and flavorful. I drink this neat and love it! Smooth and warm. Great neat or rocks. No mixers needed. Initial taste is smoky, then hints of chocolate and tobacco. Finishes on caramel. Very good drink. Not too sweet. I can taste the smoky flavor as well as a tinge of bitterness of the 'dark chocolate' flavor in the flavor profile. Additionally, I can taste a bit of the caramel, and it has some vanilla on the nose. Best rum that I've tried so far! Sweet and a tasty rum. Not sure what would be best mixer? I found this to be very smooth with a sweet vanilla finish. I would definitely recommend this to my friends and colleges. Smooth yet peppery. A sweet vanilla finish. smooth, not harsh. Notes of vanilla. It is an outstanding, intense blend of Venezuelan rums that finishing long & complex on notes of spicy oak. Smooth and well balanced premium rum. Great value for its price point. Makes a great gift for any newbies to rum. One of the best rums that I have tasted. Very flavorful. Great rum. Best simply with water on the rocks. Wonderful, smooth and sweet. Great rum for the price. Amazing Rum! Loving it, sweet and gentle taste, i recommend it to everybody! Best of the best from Venezuela. Well balanced spices aromas.